NEW BRITAIN - The Central Connecticut State men’s basketball team continues to have trouble against LIU Brooklyn. The Blackbirds opened up the game making five of their first eight shots, including two early 3-points from Ty Flowers and never looked back, handing the Blue Devils an 84-71 loss at home on Saturday. 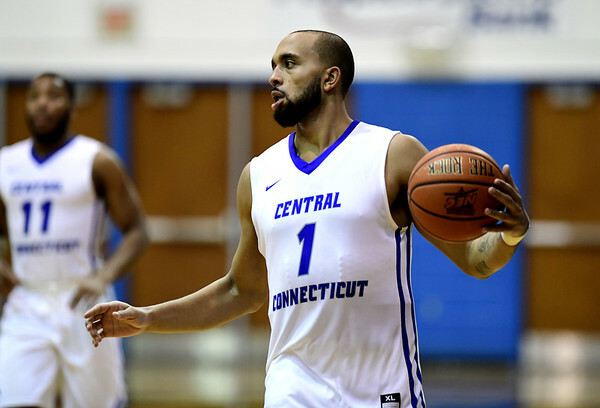 CCSU has now lost eight of the past 11 meetings to LIU Brooklyn (10-10, 4-4 Northeast Conference). Flowers scored with 11 points in the Blackbirds’ win, while Raiquan Clark and reserve Raul Frias paced LIU Brooklyn with 21 and 19 points respectively. Clark also added six rebounds and three steals with Frias contributing seven rebounds and four steals. Joe Hugley scored a team-high 16 points to lead four Blue Devils (8-13, 2-6 NEC) in double-figures. He also grabbed five rebounds. Tyler Kohl had 15 points, seven rebounds and four assists, while Deion Bute went 6-of-6 from the floor and had 14 points with seven rebounds. Ian Krishnan scored 10 points. Overall, CCSU shot 27-of-66 (.409) from the field and was just 5-of-21 (.238) from the 3-point arc. The Blackbirds, meanwhile, had a 38-35 edge on the glass and turned 16 Blue Devils turnovers into a 27-12 edge in points off turnovers. LIU Brooklyn was also helped by a number of runs throughout the contest that CCSU was unable to stop. After a pair of foul shots from Kohl and a layup from Karrington Wallace ended a 7-0 Blackbirds’ run, LIU Brooklyn went on a 11-0 run over a nearly three-minute span to push the lead to 52-30 just before halftime. A jumper by Michael Underwood made it 52-32 at the half. It was much of the same in the second with the Blue Devils once again, unable to find any answers for the Blackbirds. LIU Brooklyn went on a 13-1 spurt over a four-minute span and a three-pointer by Frias extended CCSU’s deficit to 66-42 with 13:50 remaining. The run included nine unanswered points and a Flowers jumper with 12:46 to play expanded the margin to 72-42. But the Blue Devils rolled off nine unanswered points to force the Blackbirds to call timeout. Kohl opened the spurt with a layup, followed by five straight from Hugley. A layup by Kohl with 8:35 to play cut the LIU lead to 72-51. CCSU got within 15 points with just under three minutes to play after a three-point play by Hugley. A three-pointer by Krishnan with 2:45 to play cut the deficit to 81-69. But the Blue Devils would get no closer as the Blackbirds went 3-of-4 at the foul line down the stretch and Hugley hit a pair of foul shots to close out the game's scoring. The Blue Devils will next host St. Francis Brooklyn on Thursday night. Posted in Newington Town Crier, CCSU on Sunday, 27 January 2019 13:48. Updated: Sunday, 27 January 2019 13:51.